Exactly one year ago, we launched our joint initiative with Google offering JFrog Artifactory Cloud hosted on Google Cloud Platform for free for selected open source projects. Since then, dozens of projects have been approved, and with the free open source hosting provided by JFrog and Google, are now able to put their efforts towards serving the community without having to worry about the costs of a repository manager or cloud hosting facilities. The most recent addition to this initiative is the Scientific Open Access Repository of Portugal (RCAAP), a project of the FCCN, a branch of the Portuguese Foundation for Science and Technology. With a mission to “…promote, support and facilitate the adoption of open access to Portuguese scientific research results…” (read their full mission statement here), RCAAP was a perfect candidate for this initiative. RCAAP was looking for the best place to host their Maven packages and dependencies so they could be easily available to the community. 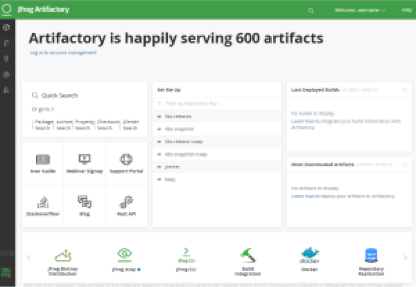 They put three repository managers to the test: JFrog Artifactory, Sonatype Nexus and Apache Archiva . Our technical team studied and tested Apache Archiva, JFrog Artifactory Open Source and Sonatype Nexus OSS, and concluded that the JFrog Artifactory for OpenSource Software was the solution that best met our requirements. To learn about what they were looking for and why the chose Artifactory, read their blog, translated below and reblogged with permission from Paulo Graça. And if you happen to speak Portuguese, you can read the original here. The RCAAP Project began using Software as a Service (SaaS) tool to provision open source binaries. The technology behind the RCAAP scientific repositories, DSpace, is based on the Java programming language. Some of the current projects and others, which we are planning to develop, use Apache Maven™ technology to manage dependencies, external code libraries, which are needed to integrate the ongoing projects. Essentially, due to Maven’s dependency management, we had an urgent need for a tool that provides the community with free access to useful code libraries that can be integrated into their projects. The RCAAP has, and will have more open source code libraries, and to facilitate its use by third parties, it is useful if these are created beforehand. In RCAAP, we wanted to transfer and centralize the libraries that we have (some of which have been developed and are maintained by third parties) so that they are accessible in a free single public access repository. Our technical team studied and tested Apache Archiva, JFrog Artifactory Open Source and Sonatype Nexus OSS, and concluded that the JFrog Artifactory for OpenSource Software was the solution that best met our requirements. An application for the use of this Software as a Service (SaaS) solution was submitted, and then accepted by JFrog. You too can submit your open source project to get JFrog Artifactory Cloud on GCP for free. Or just click below for a free trial of JFrog Artifactory.